Huzzah! 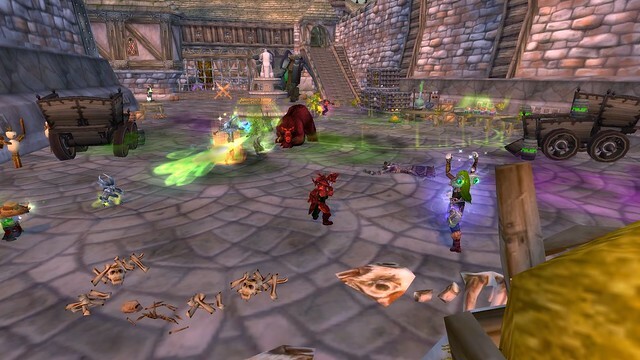 It's time for a WOW holiday! This time it's Love Is In The Air, the Valentine holiday. It started yesterday and runs through Monday, February 16th. It's a cute holiday. The decorations in the cities and towns are nice. The big things are the stuff you can get from the vendor and the necklace drops off the holiday bosses in Shadowfang Keep. For a casual player, running a holiday 5-man can be exasperating. You have a finite amount of time to play and there are so many things to do. This is just one more thing on the list. I have some observations on casual running of holidays and an overview of Love Is In The Air. First, a discussion of this holiday. If you level 100 and are not a raider or a crafter or have friends who can craft, you owe it to yourself to try to run this 5-man event often. This year, the neck pieces are ilevel 635 and one drops every time you run the encounter. This year, the neck pieces have a "use" function which grants you the achievement "It Might Just Save Your Life", a clear homage to the Huey Lewis and the News theme song from Back to the Future, which featured the year 2015. Leave it to Blizzard to work in topical references somehow. The 5-man runs for holidays don't tend to be that hard. Indeed, my bear, Ursamajor, could tank this one easily, as long as I paid attention to what he was standing in and moved him, as well as applied heals. The problem is that you have to have a tank and healer queued in your party. You can't just run over to the stone with a group of 5 and expect to zone into the holiday encounter by running through the portal. Getting into a 5-man can be immensely annoying. If you aren't in a guild, or, even if you are, and you're a dps, the wait for a tank and/or a healer can be an hour, particularly at the end of the holiday when people have what they want and don't care to run this anymore. My advice for the casual player is thus: if you are dps, do your queuing now, while the event is still hot. Get your necklace. Get the achievement. Then, if you have a tanking or healing spec, once your dps has their necklace, queue as either tank or heals. You'll be assured of getting a run. 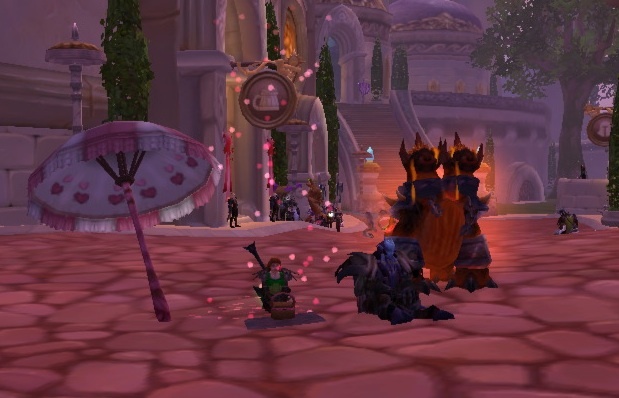 There are 2 pets this year, one a drop and the other, Lovebird Hatchling, obtained by turning in 40 love tokens. (If you are Allance and get the Toxic Wasteling, head to the Ironforge tram, where the rats spawn. Seriously. Just do it.) There is also the tallstrider mount which is purchased with 270 tokens and the very rare Big Love Rocket mount, which is a drop. Remember, pets and mounts are account wide so if you get the rocket on the toon you're using to run the encounter, you'll have it on every toon. You get the candy box in which the pet and mount are contained with your first run of the night on a toon. After that, it's just the necklace which drops. Now, some thoughts on holiday achievements/events in general. Finishing out the quests for this holiday is necessary if you want the meta achievement "What a Long Strange Trip It's Been". While you can do the Love quests within one 2 week period, others, such as getting the pets from Children's Week, simply can't be done, by design, within one holiday season. So, don't bang your head on your desk if your attempts to get someone to sit with you under your festive umbrella go for naught. A casual player is used to not getting things done because, well, it's probably not the most important thing in your life. WOWHead has a great guide to the quests and achievements and, most importantly, how to get the achievements. I think, for a casual player, one should pick which achievements are the most important to you to get. Those are the ones you work on. The next time the holiday comes around, do the same thing. Eventually, you'll complete all the achievements. If you don't have a guild to run things with, using the "Looking for Group" button could introduce you to people who are fun to run with. My primary advice is to have fun, but that's what I advise anyone playing this game to do. You should get out in the world, visit the other capital cities, even the small waypoints on the map and look at the decorations. They aren't as extensive as in Winter Veil, but they are there. And, if you need to toss rose petals on a dwarf hunter, just whisper me. I'll stand still long enough for that. As many casual players are also notorious alt-aholics, this puts us in an excellent place when it comes to holiday mount and pet drops. Remember that, although each character only gets one chance at mount and pet drops each day, every alt that qualifies gets their own chance. Since queue times for holiday dungeons are generally significantly shorter than other queue times, players who are determined to collect those special pets and mounts can run multiple alts through those encounters in well under an hour. Particularly if you start early as Gimmlette suggests.